Studio Special for $725 per month on selected units. Call now for more information and to see if you qualify. I like Senior Suites of South Shore. It's very clean, very neat, and quiet. My father is very satisfied with the property. The staff is very friendly and helpful. He has a studio apartment that's been newly rehabbed. They put new flooring in, new cabinets, and carpeting. They have a living room facility on each floor for the tenants, a free washer and dryer, and activities for the seniors. They also have on-site parking that's gated. You cook your own meals. Thank you for giving us your seal of approval! The perspectives of our residents and their families mean so much to us! Senior Suites of South shore was nice and seemed very pleasant. It was very clean, and it didn't smell. The apartments were nice, but it wasn't for me. The people were pleasant, very professional, but I'm a very active senior. I have no complaints, and everything was top of the line. I visited the Senior Suites of South Shore, and I liked it very much. I saw a studio and it was set up very nicely. I was impressed with them. The studio was very nice. I didn’t see a 1-bedroom, but I was pretty impressed with the way the studio was set up. It was clean, and the staff was very friendly. The young lady who escorted me was very nice. Thank you so much for sharing your experience with our community! We appreciate your feedback and we're delighted that you enjoyed your visit with us! Senior Suites of South Shore's building is great, but I didn't care for the area. The rooms are beautiful, and everything was great. I just didn't like the community and the surrounding area. Thank you for taking time to visit us! We were glad to learn you enjoyed your visit to our building, and would appreciate the opportunity to learn more about your experience regarding the surrounding community. Please feel free to reach out to our team at our community phone line if you have any further input. The amenities of Senior Suites were OK; I was looking at the outside, there’s a lake, and there’s a park across the street. There’s not a lot of traffic, there’s a golf course down the street, and there’s South Shore cultural center; that’s in a walking distance as well. The rooms were OK, the amenities were up to date, and the people seemed friendly. The rooms were adequate enough, and my dad would be OK living in that arrangement. Thank you for taking time to visit us! We were glad to learn you enjoyed your visit to our building, and would appreciate the opportunity to learn more about what you feel would have made your experience a five-star one. Please feel free to reach out to our team at our community phone line if you have any further input. I actually moved into this one, and I wished I hadn’t given up the place I was living in. They have a sewer issue, and the residents are using whatever to try and cover up the smell of the sewer. There are bedbugs here and just a lot of little things that lined your room. There are just a lot of little things that I’m disappointed about. They have a lot of things to improve on. This is just not the place, and it’s the Senior Suites of South Shore. The staff doesn’t listen, and they talk really fast. I wouldn’t recommend this place to anybody. There is nothing good I can say. The elevators look dirty; everything about this place is dirty. My bathroom and living room had this awful sewer smell, and between that and someone above me trying to cover it up, it’s bad. Thank you very much for taking the time to include your review of Senior Suites of South Shore. I am sorry you did not have a more positive experience. If you would like to discuss these options, or have any additional input regarding your experience, I would be happy to speak to you directly about this if you are inclined. I can be reached at 312.673.4508. Thank you, Lisa Reed, Vice President of Operations. I didn’t like what I saw at Senior Suites of South Shore. The staff was OK but they weren’t as forthcoming as they could have been. The place looked like a dollhouse; it was absolutely the tiniest living space I had ever seen in my life. I’ve never seen furniture that small. The ovens looked like an easy-bake oven for children; I didn’t even know they made stoves with ovens that small. The bed was a day bed and they have a sofa that was actually a love seat. This place is suitable for a single man who has never had a wife or family, who only has one plate, one pot, and one pair of shoes. Thank you very much for taking the time to include your review of Senior Suites of South Shore. I am sorry you did not feel our staff was forthcoming in the information they provided. I do understand your comments regarding the size of the apartments; it’s often an adjustment for seniors who may be moving from larger apartments or homes to a community like ours. However, we do find many residents, who after they are settled find the apartment quite comfortable in light of the various common areas we have for residents to use. In addition, the responsibilities & burden of bill paying are greatly reduced due to our rents including all the utilities with the exception of telephone & cable. We do have a few communities offering 2 bedroom apartments if that would better meet your needs. If you would like to discuss these options, or have any additional input regarding your experience, I would be happy to speak to you directly about this if you are inclined. I can be reached at 312.673.4508. Thank you, Lisa Reed, Vice President of Operations. I visited my mom at Senior Suites of South Shore and I got a good feeling about it and I am pretty comfortable with the staff and the management. The rooms are very clean and well-kept, they're the same rooms all over so that was a good thing because it felt you're in the same room wherever you are so I like that. They had Bingo night and grocery shopping. I am very happy with the staff. I would recommend them for the cleanliness and management. Senior Suites of South Shore looked great, clean, and decent. They had a recreation room. The staff told us a lot about Senior Suites and what they offer. It was a good experience. The rooms were nice, and the staff members that I met were nice as well as informative. I toured Senior Suites. Everything they had was what I was looking for. They had electronic check-in, and they had assigned parking. It was very close to public transportation, it was a very clean property, and it seemed to be managed pretty well. The size of the units was fine for me. I wasn’t too satisfied with the stove; it was a little too small, but it’s workable. I love how close it was to the lake shore; it was just walking distance. They have a stationary bike, and they have some problems with keeping certain equipment in the recreational rooms. They had a washer and dryer on every floor. I was satisfied with the way they organized the shuttle service. My name is Lisa Reed & I am the Vice President of Operations for the 24 Senior Suites we manage in the Chicagoland area. I would like to take this opportunity to first thank you very much for taking the time to provide your feedback related to Senior Suites of South Shore. Your comments were overwhelmingly positive. I do understand you were not overly satisfied with the size of the stove. While it may not be the size oven you are used to, our experience has shown that our residents typically find it adequate for their cooking needs once they move in to our community. I am happy to address this or other questions/concerns with you. My direct phone number is 312.673.4508. I went to Senior Suites, which my friend liked. The place seemed real nice. I had no problems with the staff; they were very helpful. He was able to get a studio apartment where he can see the lake. Senior Suites of South Shore does showcase beautiful views of Lake Michigan from many apartments at the community. We’re happy to hear that you found our staff both friendly and helpful. I’m glad your friend is enjoying their new apartment home at Senior Suites of South Shore. Please feel free to reach out to me directly with any comments or questions you may have. Thanks. Senior Suites of South Shore (2355 East 67th Street) was small. They were way too small for the money. I just can't believe how small these senior citizens' apartments are. I just feel cramped up in something like that. I have a lot of clothes, and that wouldn't help me at all. Thank you very much for taking the time to include your review of Senior Suites of South Shore. I do understand your comments regarding the size of the apartments. It’s often an adjustment for seniors who may be moving from larger apartments or homes to a community like ours. However, we do find many residents, who after they are settled find the apartment quite comfortable in light of the various common areas we have for residents to use. We additionally find that residents often find it freeing to downsize their belongings & embrace the organization that comes from living in a smaller home. In addition, the responsibilities & burden of bill paying are greatly reduced due to our rents including all the utilities with the exception of telephone & cable. I would encourage you to inquire with our Senior Suites of Midway Village or The Suites of Autumn Green at Wright Campus as we have one & two bedroom floor plans which may better accommodate your desire for more space. Should you have any questions, please don’t hesitate to call me at 312.673.4508. My mom was in Senior Suites of South Shore for a good 8 years, and I visited her quite often. I liked everything about them and everything they had to offer. They staff was very helpful with everything, and they welcomed me with open arms. It had a very friendly environment. My mother's apartment was very spacious, with lots of closet space. It was nice, especially the view. The sitting area, where you could go out to the dining area -- oh gosh, it was so beautiful! I liked that. My mom liked to go down and pay bingo games and things like that. Then she helped serve in the kitchen sometimes. I was glad that they had transportation to take her around where she had to go because there were times that I wasn't able to take her myself. I also liked that they checked on her every day to make sure she was all right, and that was great. It was a great community, and I have recommended them to a couple of people. 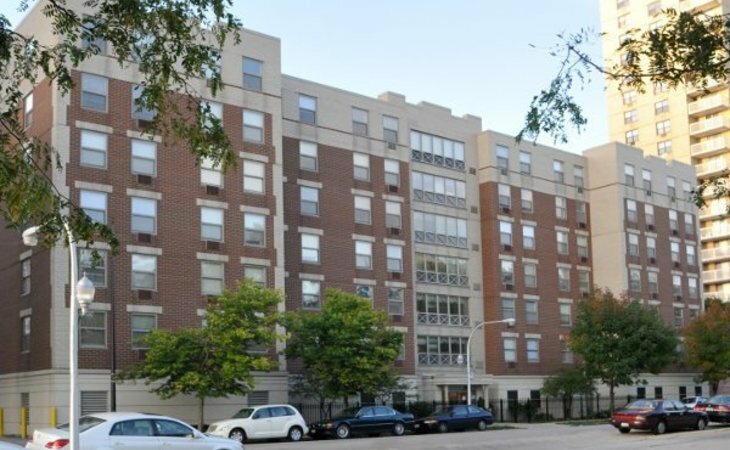 Senior Suites of South Shore in Chicago offers 96 studio and one bedroom affordable senior apartment homes with an array of desirable amenities. Income qualified residents, 62 years old and better, enjoy complimentary laundry facilities, spacious, well appointed community areas designed for opportunities for social engagement and camaraderie as well as Wellness Everyday programs throughout the month. Schedule a tour and visit our South Shore affordable income housing community today. *Residents must financially qualify for the community and the apartment for which they reside. Rental rates are based on availability, the specific income designation for the specific apartment and the applicant’s income. Rate and income levels are determined and monitored by the Department of Housing and Urban Development. What should caregivers and potential residents know about Senior Suites of South Shore?